La Royale. A direct beachfront development situated on the quiet end of Jomtien Beach. Only a few minutes away from restaurants, mini-marts, entertainment venues and shopping complexes. This 2 bedroom apartment unit is located on the 33rd floor and offers stunning views of Jomtien Bay. Available for rent fully furnished this unit features spacious living area, fitted European kitchen, high ceilings, large balcony with Jacuzzi and built-in wardrobes. The bedrooms are large with both having en-suite bathroom. The unit comes equipped with full hot water and A/C throughout. The building has 24 hour security, communal swimming pools, direct beach access and gymnasium. For sale in FOREIGN NAME OWNERSHIP and 50/50 on all tax and transfer fees. 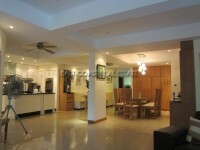 Available for rent with a minimum period of 6 month at 40,000 baht/ month and 12 month at 30,000 baht/ month.